The common green bottle fly (Phaenicia sericata or Lucilia sericata) is a blow fly found in most areas of the world, and the most well-known of the numerous green bottle fly species. It is 10–14 mm long, slightly larger than a house fly, and has brilliant, metallic, blue-green or golden coloration with black markings. It has short, sparse black bristles (setae) and three cross-grooves on the thorax. The wings are clear with light brown veins, and the legs and antennae are black. The maggots (larvae) of the fly are used for maggot therapy of infected wounds. Lucilia sericata is common all over the temperate and tropical regions of the planet, mainly the southern hemisphere, Africa and Australia. It prefers warm and moist climates and accordingly is especially common in coastal regions, but it also is present in arid areas. The female lays her eggs in meat, fish, animal corpses, infected wounds of humans or animals, and excrement. The larvae feed on decomposing tissue. The insect favours species of the genus Ovis, domestic sheep in particular. This can lead to "blow fly strike", causing problems for sheep farmers, though Lucilia sericata is not a major cause of blow fly strike in most regions. 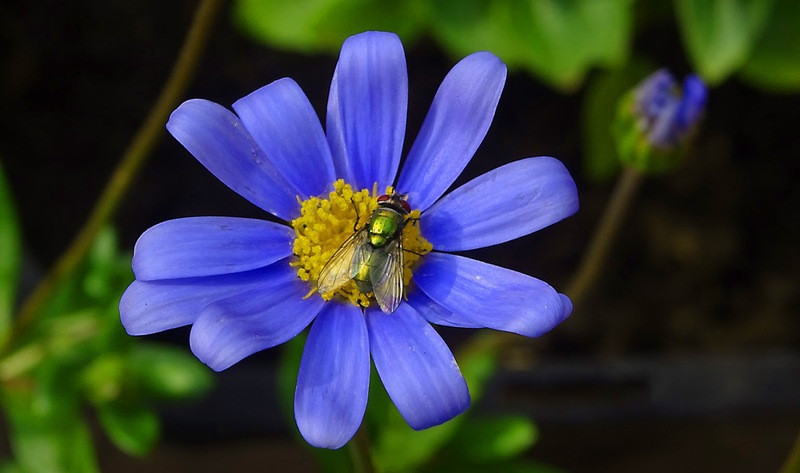 The flower is Felicia amelloides (blue daisy, blue marguerite), which is a species of flowering plant of the family Asteraceae, native to South Africa. F. amelloides is synonymous with, and formerly known as, F. aethiopica, Aster amelloides, Aster capensis, and Aster coelestis. Great colours in that one! Wow such a crystal clear capture.